Specially formulated for sensitive eyes, it soothes and gives a fresh anti eye bag effect for a well-rested look. Tested on sensitive eyes and contact wearers, its gentle formula, fresh and non greasy carefully cleanses the eyelashes, eyelids and eye area in one go. 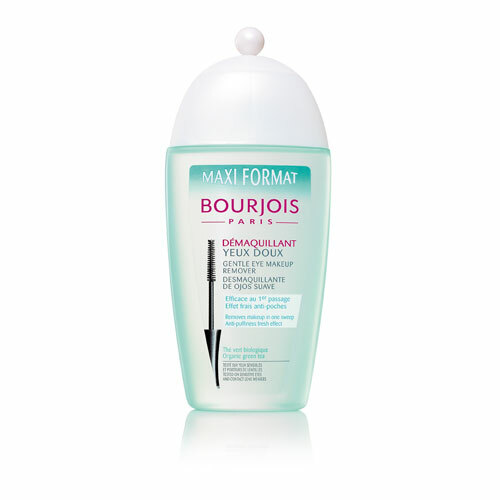 Bourjois gentle eye makeup remover is non greasy and alcohol free, this makes it ideal for contact lens wearers (like me ;-) as well as people with sensitive eyes. They say it takes your make up off in one swipe, but this is only true of you wear light eye make up. If like me, you have a bullet proof eye shadow primer/cream base + eyeshadow + liquid liner + pencil+ mascara formulation going on, it will take a couple extra swipes to get it all off. One of the great things about this product is the that you do not need to apply pressure on your eyes to get the make up off. All you need are gentle swipes and you'll be bare eyed in no time. The gentle eye makeup remover works well with regular make up but less so with water-proof makeup. Application Tip: For a more intense cleanse, they advice soaking a cotton pad with the product and gently pressing it on to your eye lids for a few seconds before swiping. Bourjois gentle eye makeup remover comes in a cute "Bourjois style" light green see through bottle, please note that Bourjois makes a series of makeup removers in the same bottle but all in different colors (light green=gentle eye makeup remover). The 200 ml bottle retails for 5Euros and since it's marked "Maxi Format" it may also be available in a smaller bottle. Bourjois gentle eye makeup remover is available at select retailers world wide, check the Bourjois website for a distributor near you. This is currently my eye make up remover of choice. Its affordable and I love that I don't need to apply pressure on my eyes for it to work.